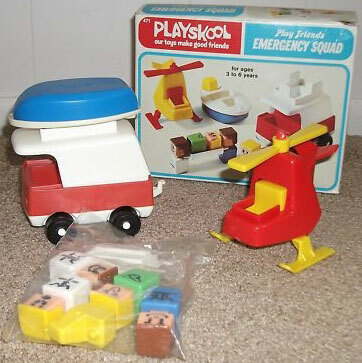 Description: No matter what the emergency, the Play Friends Emergency Squad is ready to get on the scene fast! On land, there's a 4-1/2" long ambulance, equipped with a lift-off roof and a stretcher. For sea, there's a boat with a detachable motor (boat can be carried on top of ambulance roof). For air, there's a helicopter with a propeller that rotates. Includes 2 Play Friends as the "medical team" and 2 patients. The helicopter sold in this set is similar to the #470 Rescue Center helicopter, except this set's copter DOES NOT have a drop rope with a hook on the bottom. The ambulance is exclusive to the Emergency Squad, as is the stretcher and medical team figure with yellow hair. PSK123 - Ambulance - Small red boxy ambulance with a white base that rolls on 4 black plastic wheels (marked "Playskool), held on via white rivets. The anbulance has a rectangular front seat (seats 2), a small raised backrest behind the seats, and a rectangular flatbed area in the back (holds accessory stretcher). The 2 long top edges have a slight recessed area (to attach ambulance roof). PSK124 - Ambulance Roof - White roof with solid white "walls" on 2 side, a front overhang (covers ambulance cab area), and has 3 squared shapes on the top (to attach boat or helicopter). PSK200 - Helicopter - Small boxy red helicopter with a yellow 2-blade propeller (rotates) on top and 2 yellow landing skiis on bottom. Has 1 square seat with a yellow backrest. PSK125 - Boat - Small blue 3-seat boat with a white top, 1 square front "seat", 1 rectangular (seats 2) back seat, and a slightly recessed rectangular area on the back. There is a hole in center of the rectangle to attach the removable boat motor. 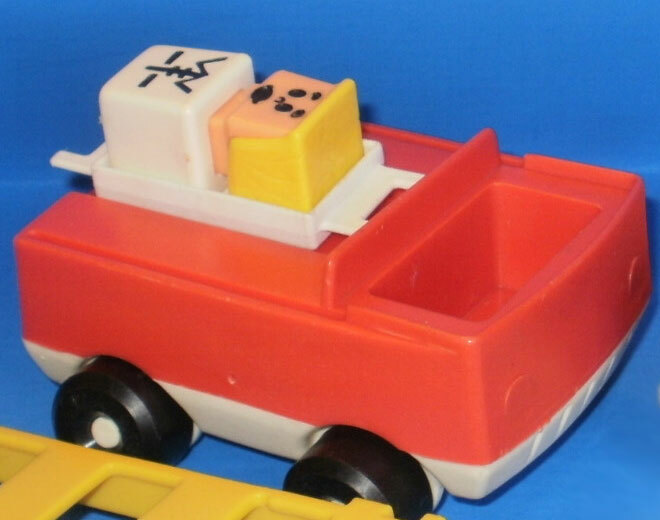 Bottom of boat is marked, "Playskool, Chicago, Illinois". Measures 4-5/16" long x 3" wide x 1" tall. 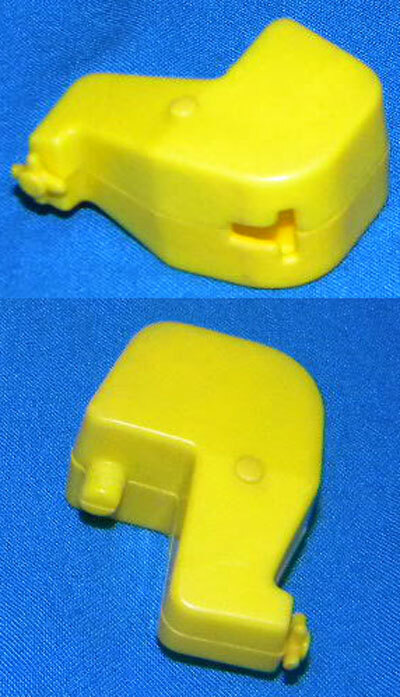 PSK126 - Boat Motor - Small yellow plastic boat motor with molded hanging propeller on the back bottom, and a peg under the squared "motor" area. Peg fits into hole on back of boat to keep motor attached to boat. PSK127 - Stretcher - White retangular stretcher with a slight raised lip on all 4 sides (to prevent figure from sliding off). Two ends of the stretch have 2 pegs (handles) that fit between square figure's head/body, allowing 2 figures to "carry" the stretcher. PSK7 - Green base, yellow hair, chest design: Curved collar, Pearl necklace. Featured in 1975 Sears Christmas Wish Book (page 489) - price $4.44.